Today, WheelsTV announced the finalists in the 2016 WheelsTV POV of the Year Award voting. It is presented in cooperation with NEMPA, the New England Motor Press Association. Rich Taber and Jim Barisano present last year’s WheelsTV POV of the Year Award to Antoinette Arianna for the 2006-12 Toyota RAV4. The antique steering wheel is from a 1976 Toyota FJ40 Land Cruiser. A juried panel composed of members of the New England Motor Press Association (NEMPA) and WheelsTV’s writers and analysts makes the final selection. Judging and voting takes place at the WheelsTV headquarters in Acton, Massachusetts. The judging panel for the 2016 WheelsTV POV of the Year is composed of NEMPA members John Paul, AAA Northeast Manager of Public Affairs and Traffic Safety; Steve Halloran, Content Guru for CarGurus.com; Rick DeMeis, contributing writer for IEEE Engineering360 and IEEE GlobalSpec; John Zangari, co-host of WPRV Drive Thru Radio; Jim MacPherson, AAA Auto Guide author and WTIC News Talk Radio Car Doctor; Mark Hurwitz, Fairview Classics; and Rich Taber, Senior Writer at WheelsTV. Also representing WheelsTV are Jim Barisano, CEO, Lehel Reeves, President and Peter Ciani, Quality Control Specialist. Unlike every other vehicle award, the WheelsTV POV of the Year pits vehicles from a variety of classes against each other with the key vehicle attributes being dependability, reasonable repair costs and the level of vehicle owners’ satisfaction with their used car. The challenge for the POVY panel of judges is to select a single standout from category winners in eight diverse classes. Green Cars, SUV, Crossover, Sporty Car, Small Car, Family Car, Light Truck and Luxury Car. Following the panel discussion, Wayne Carini, star of Velocity Channel’s Chasing Classic Cars, will host the awards ceremony, which will recognize new vehicles that are standout performers in New England’s four-season environment. The ceremony will conclude with the announcement of the 2016 WheelsTV POV of the Year award recipient by WheelsTV’s CEO, Jim Barisano. 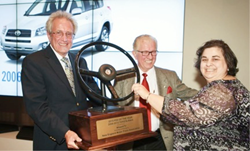 Each year the POV of the Year trophy sports an actual antique steering wheel from the winning marque, making it, physically, the largest national award in the auto industry. For more information on the New England Motor Press Association, please go to NEMPA.org. WheelsTV (http://www.WheelsTV.net) is the first multi-screen video technology company in the U.S. devoted exclusively to consumers’ interests in cars, trucks and motorcycles – WheelsTV’s Dealer Video Showroom is revolutionizing the car-buying process, making it faster, more efficient and more enjoyable. WheelsTV is a service of Automotive Networks Corporation, headquartered in Acton, Massachusetts with a technology facility in Los Angeles, California.